Watermen overharvested oysters last winter in a little more than half of Maryland’s portion of the Chesapeake Bay watershed, according to the state’s first-ever stock assessment of the commercially and ecologically valuable shellfish. If those harvest rates continue, the assessment warned, the bivalve population in those areas could eventually be wiped out. The 359-page assessment report, released Tuesday, estimated that Maryland’s overall population of adult oysters this year is half what it was 18 years ago. The assessment, prepared by the Department of Natural Resources in consultation with the University of Maryland Center for Environmental Science, sets the stage for a potentially fractious debate in coming months over the state’s management of the keystone Bay species, which is also a pillar of Maryland’s seafood industry. Mandated in 2017 by the General Assembly, the stock assessment drew on DNR surveys and catch data from 1999 through the wild oyster harvest season that ended last spring. DNR and UMCES scientists used mathematical models to estimate oyster abundance, habitat availability, harvest rates and natural mortality from environmental conditions such as harsh weather and disease. The study estimated that Maryland’s oyster population plummeted from about 600 million in 1999 to around 200 million by 2002, a period that saw the Bay’s bivalves ravaged by an outbreak of the oyster diseases MSX and Dermo. The harvest hit an all-time low of 19,000 bushels in 2004. The diseases abated after that, and the study estimates that the state’s oyster stock rebounded to more than 450 million by 2014, with harvests also rising that year to more than 400,000 bushels. Since then, natural reproduction has been lackluster, and the assessment estimated that the population has declined again to an estimated 300 million this year. Last season’s harvest slipped to 180,000 bushels. The study didn’t assess whether the state’s oyster population as a whole was overharvested, but rather weighed the bivalves’ status in each of 36 different zones spanning Maryland’s portion of the Bay and its tributaries. “What’s happening with oysters in different parts of the Bay is different,” explained Mike Wilberg, an associate professor at UMCES’ Chesapeake Biological Laboratory, who worked with DNR scientists to conduct the stock assessment. 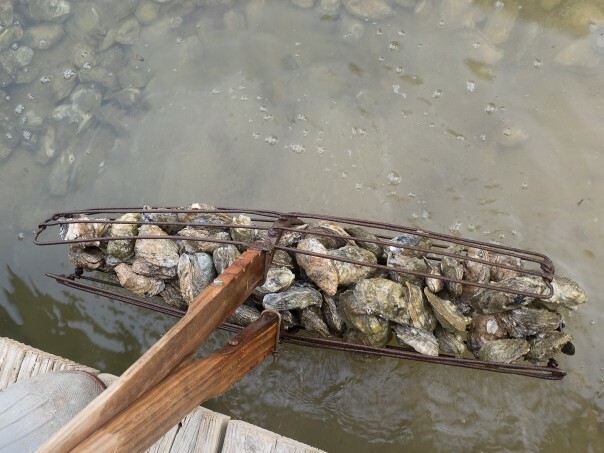 Oysters tend to be less abundant in the Upper Bay and its tributaries, such as the Chester River, where lower salinity in the water tends to impede reproduction. Reproduction and abundance are better in saltier water farther south in places like Tangier Sound and the Maryland tributaries of the Potomac River, but those also happen to be the areas more affected by diseases. For each area of the Bay, the report identified a threshold harvest rate that, if regularly exceeded, it predicted would lead to eventual population declines. It also set a target for each area that if the percentage of oysters harvested regularly stayed at or below that level, the catch would be maximized over time while the population would remain stable or even increase. In some areas, including all of the Western Shore tributaries and Eastern Bay, the assessment found that almost any level of harvest would deplete the stock because abundance was so low. The assessment found that fishing pressure exceeded sustainable levels, given natural mortality and reproduction, in 19 of the 36 zones into which the state’s portion of the Bay had been divided. Overfishing occurred last season in most of the Tangier Sound area, in Eastern Bay, in the Patuxent River and in the Potomac River tributaries, it said. In 14 areas, though — including most of the Choptank River and the Bay mainstem — fishing pressure last season was at or below the target for maximizing harvest and maintaining oyster abundance. And in three areas — two in southern Tangier Sound and one in the Honga River — the harvest rate was below the ceiling for sustainability but above the target for building or maintaining the population. Wilberg stressed that the assessment only looked at the status of the oyster population, not at how it should be managed. When the final report is submitted to the General Assembly by Dec. 1, DNR officials said it would include a list of management options, without making any recommendations. That report is certain to revive debate about how the state’s oyster fishery ought to be managed. Maryland expanded its oyster sanctuary network in 2010 to cover 25 percent of state waters — a move that drew the ire of watermen. They complained that the new harvest-free zones took three-fourths of their best oystering areas. And they have pressed to get back into at least some of those areas. In early 2017, with wild harvests on the decline, the DNR proposed to open some of the state’s oyster sanctuaries. But lawmakers blocked that move by requiring the department to conduct a stock assessment first and figure out a sustainable harvest rate. Watermen on the DNR advisory commission found fault with the assessment’s methods and conclusions Monday night. Robert T. Brown, president of the Maryland Watermen’s Association, questioned the report’s finding that the highest harvest rate that could be sustained anywhere in the Bay was 43 percent in Fishing Bay, with even lower sustainable harvest thresholds elsewhere. He said the reason so many areas seemed to be overfished was because watermen had been forced to work remaining areas more intensively after being forced out of the sanctuaries. Ron Fithian, a Kent County commissioner and former waterman, put much of the blame for declines in oyster abundance on the state’s abandonment in 2006 of an annual program of replenishing oyster reefs with shells. The subsequent expansion of sanctuaries has made it worse, he argued. Large-scale oyster restoration efforts launched in sanctuaries in Harris Creek, the Little Choptank River and Tred Avon River on Maryland’s Eastern Shore do appear to be succeeding, according to a recent report by the National Oceanic and Atmospheric Administration. Monitoring in 2017 found hatchery-spawned oysters that had been planted on restored reefs were surviving and growing, and that there was evidence of natural reproduction, with new young oysters appearing since the plantings. The stock assessment factored the state’s extensive network of oyster sanctuaries into its estimation of bivalve abundance in each area around the Bay. But it said there wasn’t any way at this time to tell whether there was any spillover of reproduction from the oysters in those harvest-free zones that would allow for higher sustainable harvest rates in neighboring public fishery areas. The Bay has changed greatly since the heyday of its oyster fishery in the late 1800s, Rago pointed out. Much of the oyster reef habitat has been lost, water quality has declined and diseases have caused significant die-offs. The estimated total population of 300 million oysters in Maryland waters in 2018 is less than 10 percent of what was harvested each year before 1900, he noted. While the Bay’s oyster population can benefit from reduced diseases, better reproduction and continuing efforts to clean up pollution, Rago said, rebuilding the stock will also require enhancement of reef habitat and control of fishing mortality. With the assessment’s findings as a guide, Rago added “the big challenges are yet to come.” It won’t be easy, he said, to follow the science while balancing the competing interests of watermen, oyster farmers and those seeking to increase the oyster population because of its ecological benefits to the Bay. Oysters help to filter the Bay’s water, and their reefs provide habitat for fish, crabs and other marine creatures. DNR officials said the stock assessment would be used to update the state’s fishery management plan for oysters. Chris Judy, chief of the DNR’s shellfish division, said that process would begin soon, after review of the assessment by lawmakers and public feedback. He said it would be “many months down the road” before the revision would be complete.